The opamp is part of the current regulation and control function. It compares the voltage drop across the R7 sense resistor with the voltage signal that represents the commanded or set-point current. When the sense voltage is below the command voltage, then the opamp output signal provides feedback to the driver that more current is needed, i.e. to increase the current. Once the sense voltage equals or slightly exceeds the command voltage, then the opamp output signal provides feedback to the driver to hold or slightly reduce the current. I've done my best to clean the IC's pins off excess solder, it looks clean and the thing works. However, it now has some weird oddities: sometimes it may not power up, requiring an additional switch cycle, or it may enter an unexpected early low voltage warning which resets after a half-press… Oddity frequency is uncommon, fortunately. Oh! What chip is that? LoL! 1st up is the light engine I made for the new Desert Tan S2+ when I get it. MTG2 M0 4000K at 3.5A. In a Green S2+ for a test bed. Really cool to have an MTG2 on a single cell in an S2+. Pill is a stock pill with the driver pocket machined out. Reflector is a stock reflector with the emitter opening expanded by hand using a hobby knife. Were you able to machine a shelf into the pill? The pill barely seems wide enough. FWIW an Eagle Eye A6 can also (with a little work) accommodate an H1-A and still use its retaining ring — which is a plus when it comes time to flash the driver. This is a very interesting revelation that I’ve never known about, I’ve been studying options for building a tube light similar Jensen567’s mod, and with this it sounds like the A6 would serve for a better host. A quick look inside my BLF A6 revealed why: With the built in shelf design the retaining ring is wider, threading to the body tube itself vs the inside of the S2+ removable pill. Although the A6 has a slightly smaller tube I.D., being able to use the ring would solve a lot of issues for this mod. Another option that I’m thinking now is the Convoy S3, since it has also has the pill-less design. but I’m not sure how the threading in it’s head compares to the A6. One more idea came to mind as well for the S2+, I could get an 18350 tube (around $2.00) and cut off a short ring from the end of the threaded portion, make a few tool notches in it (for installation/removal) and use that as a retaining ring, it would be way thinner than the A6 brass ring, which is rather thick, so it may work better to clear any components near the edge of the driver. … sometimes it may not power up, requiring an additional switch cycle, or it may enter an unexpected early low voltage warning which resets after a half-press… Oddity frequency is uncommon, fortunately. Baby, this is because the tailcap switch is screwed. Hi, I have problem with H2-C, only has one mode, the lowest: http://budgetlightforum.com/node/60876. Any ideas? Question for Jensen567: did you tried any lighted tailcap mod with the H1-A? Just seen the latest full copper body Convoy S2+ limited edition and was wondering if the lighted tailcap option would work without major issues with an H1-A. Another little question: Jensen567 I see you boosted H1-A driving current up to 3.75A (R025 + R100 = R020), do you believe it could be reasonable to pump it up a little bit higher? Like for example R025 + R050 = <R017 (4.5A, 16.67mΩ) or maybe R025 + R100 + 2(R330) = <R018 (≈4.2A, ≈17.84mΩ). I wonder if heat could be a problem. This is the only real info I’ve found on modding the H1-A sense resistor for increased current. What size is the resistor? 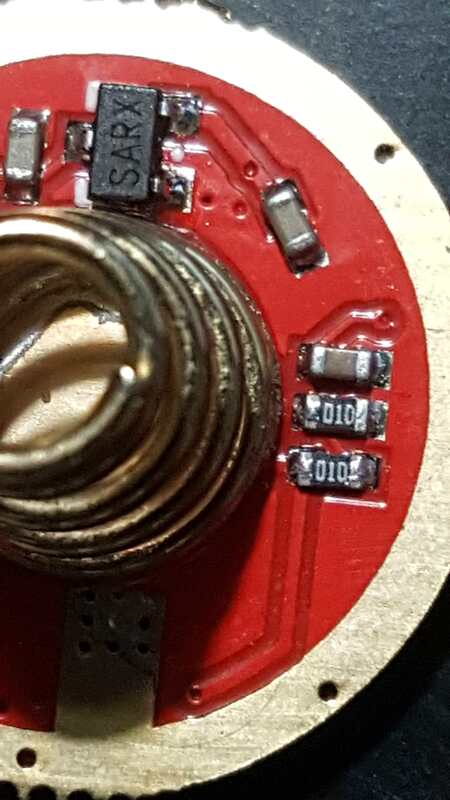 I’m looking to order some R100s and very unfamiliar with SMD resistor sizing. So exactly what kind of resistor should I be ordering? Will 1206 1% SMD 0.1 Ohm work? … So exactly what kind of resistor should I be ordering? Will 1206 1% SMD 0.1 Ohm work? Measured mine: slightly above 3mm in lenght and about half of that in width, I guess that means it is a 1206 imperial. Did someone noticed the H1-A's layout is somewhat different from what is show in the product pictures? I was yesterday playing with one of them and somehow messed up with the capacitors by the inductor's lead, lost one of them and the other is damaged I believe (don't ask me how that could happen, but it gave me reason to send a m@r@n where he belongs). Measured such capacitance (2x capacitors) in a brand new driver and got ≈120µF which is a lot. Gotta have to measure another unit I have at hand unpackaged. Biggest 3.5 × 2.8mm size 16V SMD caps I've found on AliExpress are 47µF each. May someone confirm such capacitance stack size? Bought these 16V 47µF tantalum capacitors to fix it. They're polarized, this means likely it is that the non-polarized capacitors I am replacing probably were 2x 22µF units. Mmm, this means just one would do. Tantalum caps have higher ESR, so there is good chance they will release some smoke. The bane of many Macbooks since 3 generations. You mean increased blow up chance? Well, if that is so I'll install capacitors on both PCB “slots” and hope for the best (even if this means capacitance is gonna be about twice). KD has changed some things on the H1-A. Mainly resistor values. I have read along Jensen567 following all your mods, thanks for posting by the way. 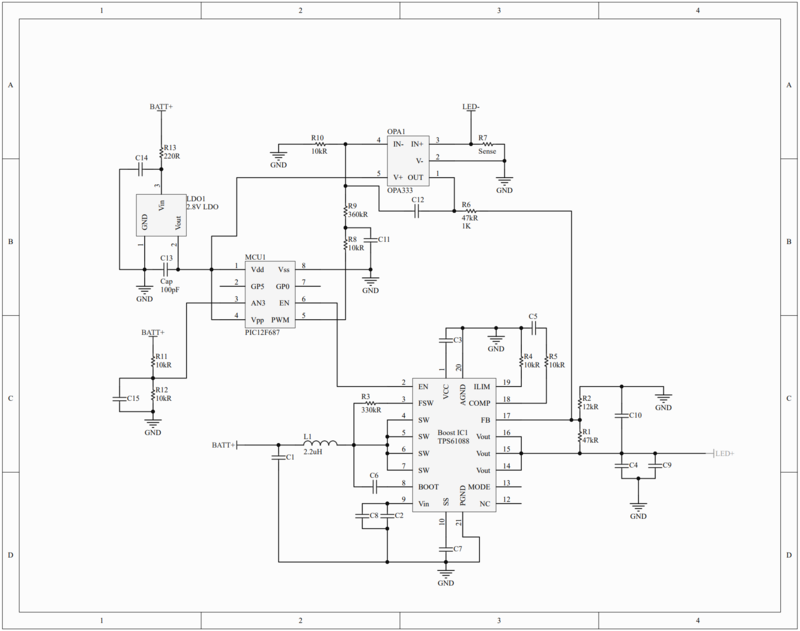 What I’m trying to achieve is about 12v out at about 2 amps driving a triple series Seoul Viosys UV emitters. I reflowed the leds on to a series 20mm board encase you are wonder about that link. The R1 resistor is now a 01D (factory) 100k (at least I think its R1) so I assumed the driver works around the 12.6v limit now. So I hooked ever thing up on my power supply and bam the driver works with the series triple Seoul but I can only get about 500 ma output. I thought the sense resistor determined the output current. I had not changed it and was going to limit the power supply current to keep from damaging the emitters, just testing. I haven’t changed anything on the board yet, looking for advice as what I do need to change on this new revised board. I also want to change the LVP to 2.75v but I would like to get close with output working first. Any advice is appreciated. Repaired my driver. Ended up buying ceramic capacitors, a size bigger but made them fit. Bought 'em of 22µF capacity and my guess was right. I noticed the differences moderator007 describe too. I just fired this thing back up again, this time I hooked up a second meter to monitor voltage to the emitter. I got 11.25V to the emitter’s and at .971ma of current across the emitter. The input voltage was at 4.1V and about 3.25 amps in. I’m thinking maybe the 100k resistor is still to small to get to the 12.6V limit. 120k or 150k might get there. Jennsen, while deciding on which 1s boost driver I want to use in my Convoy L6 I saw all your posts regarding the KX70 driver from kaidomain. Thanks a lot for all that data! I also want to do your ldo+cap mod. What current rating does the 2.8V LDO need? I found some with 150mA for example. I want to have a max of 4A. The ldo mod shouldn’t change that? What I don’t understand is how your ldo mod changes the lower modes? … just wish modes were off-time, and I wish LVP was set lower, around 2.7-2.8. From what I see and fathom here, LVP condition is when voltage at pin 3 goes down to 1.5V. If so, replacing R11 with an 8KΩ resistor results in 2.7V LVP, or changing R12 by a 12KΩ one does 2.75V LVP. I haven't changed anything on the board yet, looking for advice as what I do need to change on this new revised board. I also want to change the LVP to 2.75v but I would like to get close with output working first. Any advice is appreciated. For the love of God, may someone point out what/where are the 10KΩ “01C” resistors pertaining to the MCU's pin 3 battery input divider? Seems like that 01C below the MCU in the picture could be R12, but where the @#$% is R11? May someone confirm? I can't figure out if something else has changed from here, may have to peek at my drivers. There on the other side of the driver next to the spring. It took me a little while to trace them down. 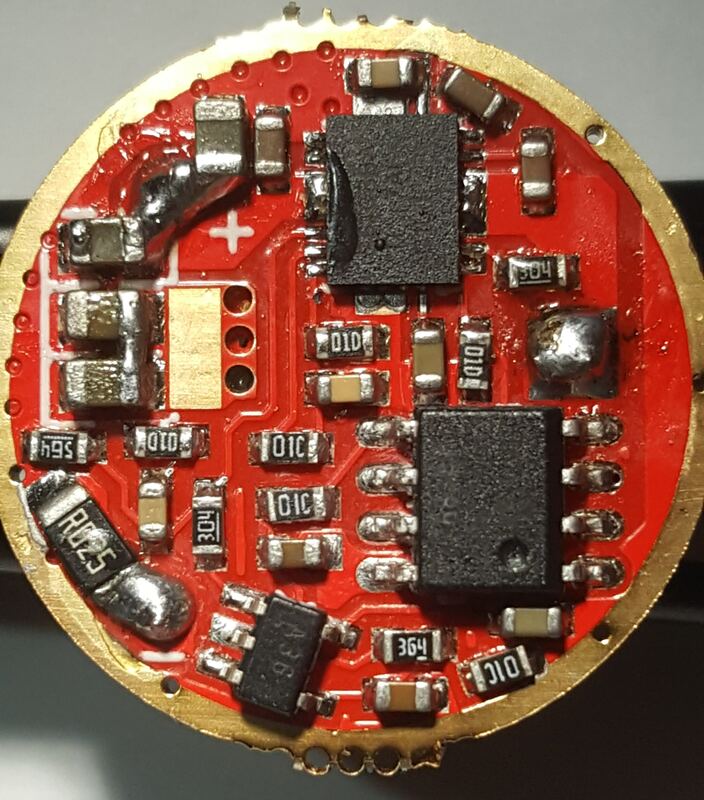 If you trace pin 3 to the battery side of the driver there they will be with a small capacitor. I can take a pic if needed, it will just be awhile before i can get free. R2 is below the capacitor and R1 is below R2, with the trace running to the spring. 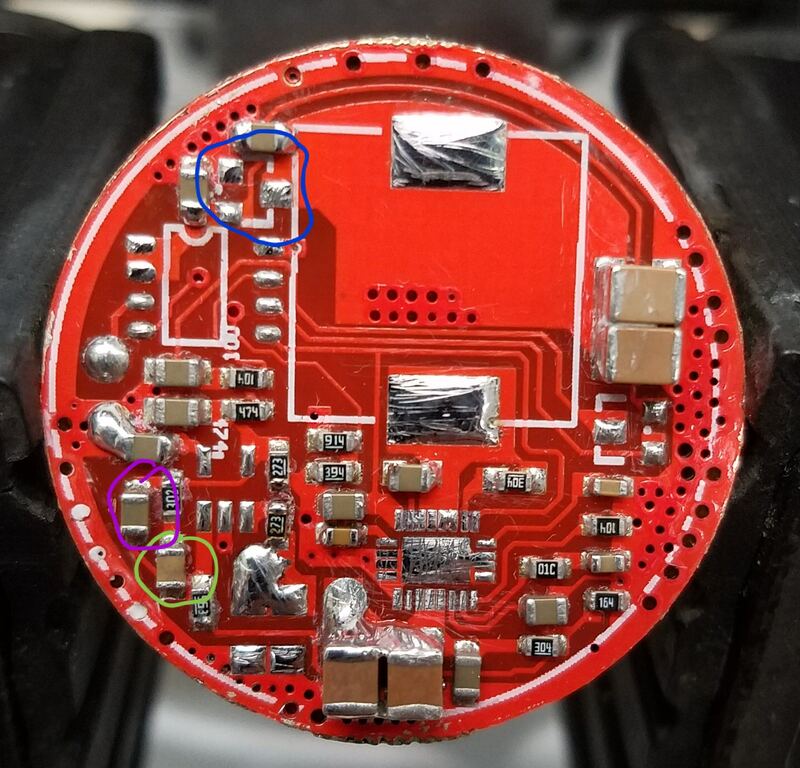 That hole with a trace above the right side of the capacitor is pin 3 from the other side. 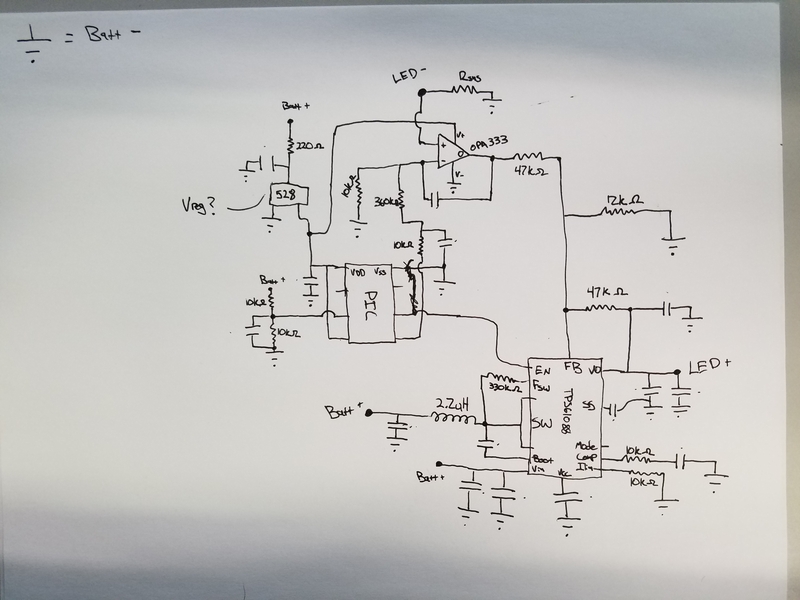 I can’t remember exactly what value I changed it to but the first time I changed the divider value the driver would run down to 2.4V on a bench power supply but at a very low current. So the boost IC will work at a lower than rated voltage. I believe you meant “R12 is below the capacitor and R11 is below R12, with the trace running to the spring”. Thanks, this means the divider is now set with 100KΩ resistors, and much easier to access. Thank God. It looks like an Attiny programmed for the GT should plug right in place of the PIC with the right adapter board. Are there more boards around here somewhere? Where does the switch connect to? What's wrong with PIC microcontrollers? PIC microcontrollers are widespread among lots of great drivers. The existing disregard against these microcontrollers is odd to me, it is sort of like swimming against the tide. Porting the high level language code among them should not be hard. I don’t think anyone here cares about the name on the chip, it’s the program inside. If you can point me to a pic program as good as Bistro, Narsil or Anduril I’d greatly appreciate it. I’ve tried porting Anduril to an Attiny 1634 and failed. I’m not even going to try moving it onto a pic. … it's the program inside. If you can point me to a pic program as good as Bistro, Narsil or Anduril I'd greatly appreciate it. I've tried porting Anduril to an Attiny 1634 and failed. I'm not even going to try moving it onto a pic. As far as I understand, you're programming in high level language. High level languages plus compilers is what allows developers to port Android into diverse architectures without much hassle, something also done over the years by multi-platform game developers. I am not saying it is challenge free. Here we are dealing with easy as a pie architectures, though. Both ATtiny25 and PIC12F683 are 8-bit microcontrollers with 2KB of flash, 128 bytes of SRAM and 128/256 bytes of EEPROM. Porting from ATtiny25 to PIC12F683 should be pretty straightforward. By the way, I neither Bistro, Narsil nor Anduril, and this is not my war. But I believe you're restricting yourselves too much, and the driver technology you're making use of is just bollocksy outdated (AMC7135s). HKJ will soon publish a review of a variable output linear driver without PWM. But I believe you’re restricting yourselves too much, and the driver technology you’re making use of is just bollocksy outdated (AMC7135s). HKJ will soon publish a review of a variable output linear driver without PWM. HJK has already tested such a driver , one of the early LDx drivers. They are cheap and work great. I don’t see how such a Chinese driver is going to be better. … it’s the program inside. As far as I understand, you’re programming in high level language. High level languages plus compilers is what allows developers to port Android into diverse architectures without much hassle, something also done over the years by multi-platform game developers. I am not saying it is challenge free. By the way, I neither Bistro, Narsil nor Anduril, and this is not my war. But I believe you’re restricting yourselves too much, and the driver technology you’re making use of is just bollocksy outdated (AMC7135s). HKJ will soon publish a review of a variable output linear driver without PWM. It’s not so easy because Narsil/Andruil use a lot of hardware-specific idioms. Doable, but definitely not straightforward.